I apologize if there is already a TV thread here. Couldn't find one, esp. since I can't search for "TV". Here's a brief description: In this series (formerly called Legion), 20 years after evil angels descended from heaven to lay waste to the human souls they felt God had favored over them, a reluctant “savior” must arise to protect Vega, the last remaining stronghold of humanity. The savior has more to fear than just angels, as the elites of this new society conspire to gain power for themselves. I just watched the pilot for this and thought it promising. "Great" TV, no, but it is in the fantasy range if you like that sort of thing. I think Anthony Stewart Head (Giles from BuffY) is good in this, but with American accent! I just recorded this the other night. I can't wait to check this one out. Let us know what you think about it, Angel. Quite an interesting and imaginative show. I have always been a fiction fanatic. The more "magic" and science fiction, the better. Movies, books.... I love it. The human condition seems to be represented in a very unique way. Excellent, Angel. I'm looking forward to the next episode!! If you like global virus pandemic type movies or scenarios then "The Last Ship" could be a good one. I watched the pilot for this last night, seems ok..ish could get interesting. Let me know what you guys think. Thanks clavicus! I was planning on watching the pilot for that one next! Interesting show, I found it coincidental on several fronts. That's a great analysis, phillip. Woah so the second episode of the last ship was intense, if im not mistaken but the viral outbreak is just a bit short of being called EBOLA virus....which is killing a great some in south west africa. Anyway this show explains the disease as a slow ocurring death through the same means as Ebola except for blood spilling out sores of your body..
the prisoner, original from the 6o's not the 2009 re-make. opened a lot of eyes. all the episodes can be found on you tube. first read the following, familiarize what mcgoohan tried to convey. any one finds the "40 pages" that was the initial concept of the prisoner please share it. "“How free are we?” asks Patrick McGoohan, the creator and star of the series, “I think we’re being imprisoned and engulfed by…” here it almost seems unfair to continue in words, which cannot express his concerns as fully as the series does, but…“we’re being imprisoned and engulfed by a scientific and materialistic world. The Prisoner not only shows you why McGoohan is concerned, but offers alternative ways of looking at those concerns. For The Prisoner is an allegory that sets a man in unexplained captivity, depriving him of his liberty, privacy, and name. The series then tells of his successful efforts against all imaginable odds to regain his freedom. But he is struggling to gain his freedom from a world that strongly resembles our own world; only he sees it as a prison while we do not." 20th century history as we know it is a lie. Aliens have been among us since the 1940's, but a government cover-up has prevented the public from knowing this. As the series progresses, we follow John Loengard and Kim Sayers as they attempt to thwart numerous plans of the alien Hive, most of which are tied to historical events and figures. In addition, the pair must stay one step ahead of a covert government agency, Majestic-12, tasked with fighting the aliens while maintaining the conspiracy of silence. Not that I am a fan of David Wilcock and not sure about Corey Goode, just putting this here for the new series info. Update - December 2nd 2015: Corey added a comment to this post revealing even more information about this fictional series. Apparently the writers used the pen name, "James S.A. Corey", which of course strongly resembles Goode's name. That comment is at the end of this post. Corey Goode, who calms to be a secret space program insider, recently shared a comment regarding a new TV series on Syfi entitled The Expanse, which premieres on December 14th 2015. Goode implies in his comment, that the show is possibly based on the information he has been releasing, matching other secret space program whistleblowers. This wouldn't be the first time deeply classified information is rendered into fiction for the purposes of hiding it in plain sight; by using normalization techniques. We've been covering material he presents on his weekly show Cosmic Disclosure, on Gaia TV with David Wilcock. In the future, where the Asteroid Belt has been colonized, the investigation into the mysterious disappearance of a young heiress sets off a series of events that will change humanity. 2 night premiere of The Expanse, December 14th on Syfy. Published on Dec 9, 2015The world reacts to the arrival of the Overlords. Who they are is heartbreaking. Watch the three night event, starts Dec 14 at 8/7c on Syfy. I think I will bust out a new movie thread as all of the future movies are following the same story line......lets see how many we can find! If you have Netflix, you will want to watch this compelling documentary - Making a Murderer. Be sure you have time because you will want to binge watch it! I think you might also be able to find the first episode on YouTube. Published on Dec 11, 2015 He served 18 years for a crime he didn't commit. Now he's on the line again, and some want to see him put away for good. FARGO....just started binge watching this season....3 episodes in and there are conspiracy theories, ufos and "aliens".....Fargo.....who'da thunk? 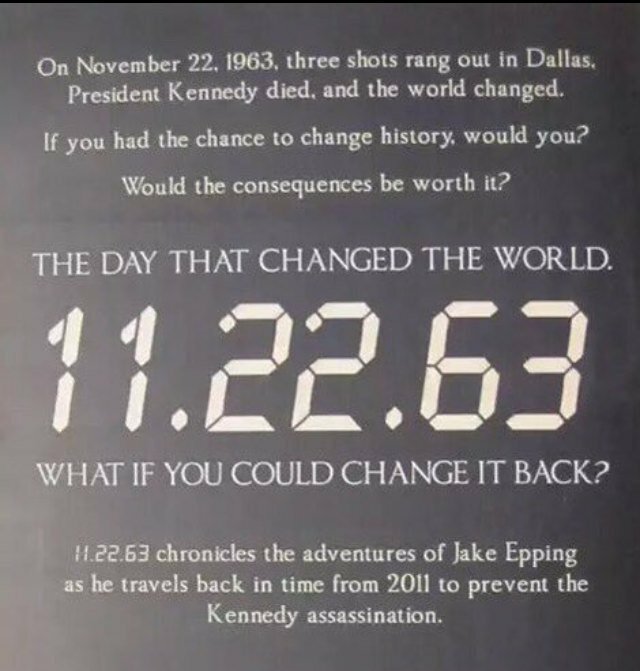 Al asks Jake to head back to the past and create a better world by stopping the Kennedy assassination. Jake heads down the rabbit hole to begin his mission but finds that changing the past is far more dangerous than he ever would have dreamed. Has anyone yet watched "Braindead?" OMG it is just the best show I've seen in a long long time and is up to the moment with current events. It's on Monday nights on CBS and it's so much fun and just a great thriller/comedy. From an original and different opening song by Jonathan Coulton for each episode during the credits all the way to next week’s preview, you won’t be bored. Especially when half of DC is infected by “aliens” in the form of ants that enter through the ear!!!! Watch it! Oh, and then, watch the real congress and see if they’re as infected as they appear on the show. Could be. Take a listen to episode 2 song recapping episode 1.